Bunduk is a Rhodok crossbowman and overall tough fighter. He has the highest starting Strength and is tied for the highest starting Ironflesh of any recruitable hero, giving him the most initial hit points of all the companions. With him a top priority should be to upgrade his equipment. Don't expect to find a Masterwork Siege Crossbow and Large Bag of Steel Bolts at the first town you shop in, but have a mind for getting his ranged equipment as good as you can, as there isn't as much variety in crossbows as there is other types of equipment. What you should do as soon as you pick him up is put a shield in his fourth weapon slot, preferably a shield with large coverage against ranged attacks such as a Board Shield. He is also a trainer, which you should expand upon as his disrespectful personality will upset Lezalit. Aiding this is his relatively high starting level, reflecting his experience in defending Grunwalder Castle from the Swadians. You should also raise his Agility so you can boost his Shield skill and later Weapon Master, raising his Athletics should be a lower priority as he won't be getting into the fray too often, and as a crossbowman he should never be on a horse. Raising his Strength can be put off for a bit because he is already well-off in that regard. Raising his Intelligence for Trainer and skill points is sound, but investing in party skills would be putting him in a role he isn't the best suited to, and should only be done with consideration. He isn't noble so think twice before raising his Charisma and Leadership in preparation for making him a lord. Bunduk starts with Padded Leather armor, Nomad Boots, a Crossbow, Bolts, and a Pickaxe. 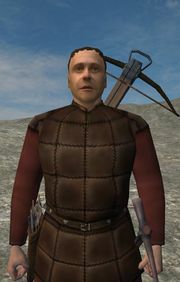 In Warband, he can be sent on a mission to his hometown Jelkala to determine the internal state of affairs in the Kingdom of Rhodoks. Sending out Bunduk to spread word of your claim to the throne will upset Deshavi and support the argument that you will deal with all men fairly and uphold the rights of the commons when attempting to persuade lords to join you. If made a lord, he will respond positively to characters with high honor. This page was last edited on 22 June 2011, at 04:32. This page has been accessed 77,237 times.